regrowth treatment. It is called Plasma Rich Plasma Therapy. plasma is then enriched with other nutrients like protein. After this, the platelets and growth factors are collected from the sample and injected into the scalp where the hair is thinning. This is a non-invasive procedure which only requires local anesthesia, it helps to regrow hair by stimulating stem cells. The injected platelets allow the hair follicles to get activated causing the hair to regrow. PRP is a good technique effective for hereditary hair loss that affects both men and women. The best candidates for PRP are considered the people who have recently begun to lose hair. PRP cannot work for anyone who is completely bald as it is not possible to regrow all lost hairs. The entire PRP process including the injection takes about 90 minutes. Generally it requires one sitting per month for the first four months and then two maintenance treatments are suggested per year. 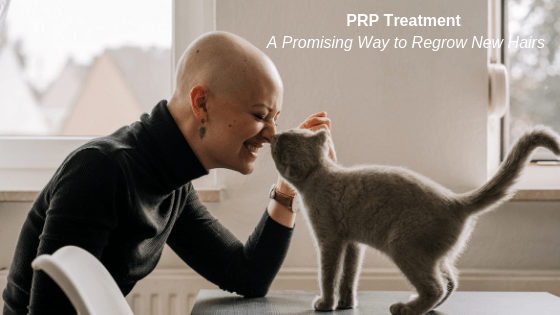 PRP is a cost effective technique of hair regrowth and involves low level of risk associated with the treatment and there are no safety issues as it uses the person’s own blood. It is a safe treatment with no side effects and is showing impressive results in reversing hair loss. Platelet-Rich Plasma therapy is the richest source of growth factors that are responsible for dividing the regenerating the stem cells to make them grow rapidly. The technology has shown promising results in various things like regulating the immune system, hormonal balance, production of new hair follicles and improving hair texture and strength. People suffering from hair loss in various ways can benefit from PRP treatment. The treatment not only promotes hair growth but also strengthens hair follicles. It is not effective for people with complete hair loss, but it is really a very effective treatment for making the existing thinning hair thicker by strengthening the hair follicles. This treatment offers a permanent solution for hair loss and gives the person a positive hope and confident way of living. The hair regrowth is natural and so it gives a natural look. It can visually improve hair restoration, texture, and strength and hair growth giving a completely changed and natural look to the person. If you are impatient and stressed because of hair loss, now you need not to worry. You can opt out the PRP treatment for complete recovery of your hair loss and regain your confidence with natural hair growth. It is a promising way of regrowing lost hair.